Most vintage basic white tees are crewnecks. And hey that’s great. The neck is usually a little higher and a little tighter than on your typical t-shirt, which can be uncomfortable for the neck-sensitive. 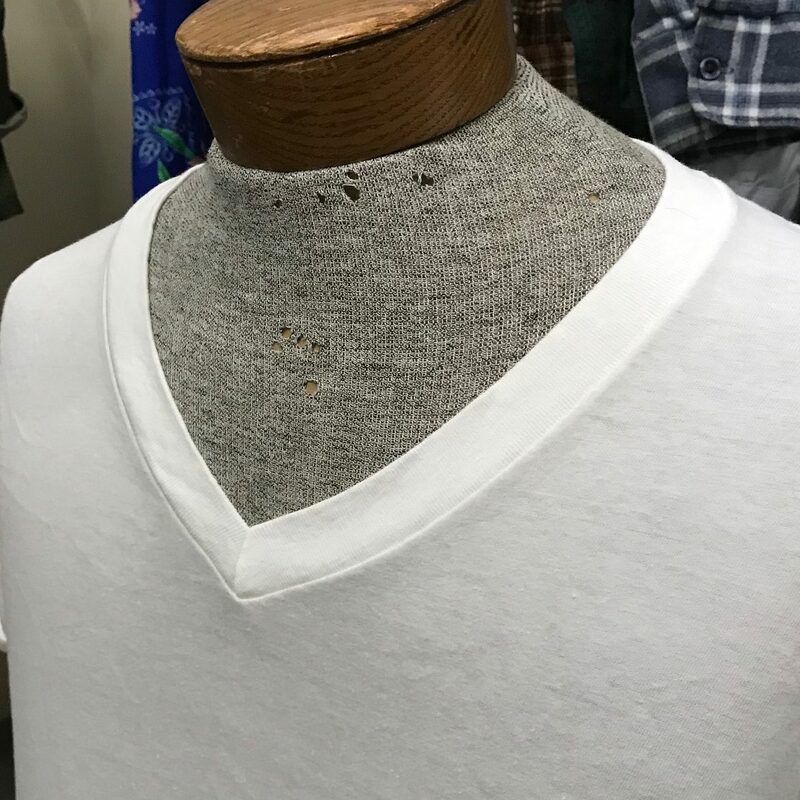 Vintage v-necks tend to be a bit wider and deeper than contemporary ones. These were made to be unseen undershirts, after all. The designers at Fruit of the Loom in the 1970s did not anticipate the v-neck craze of 2010. 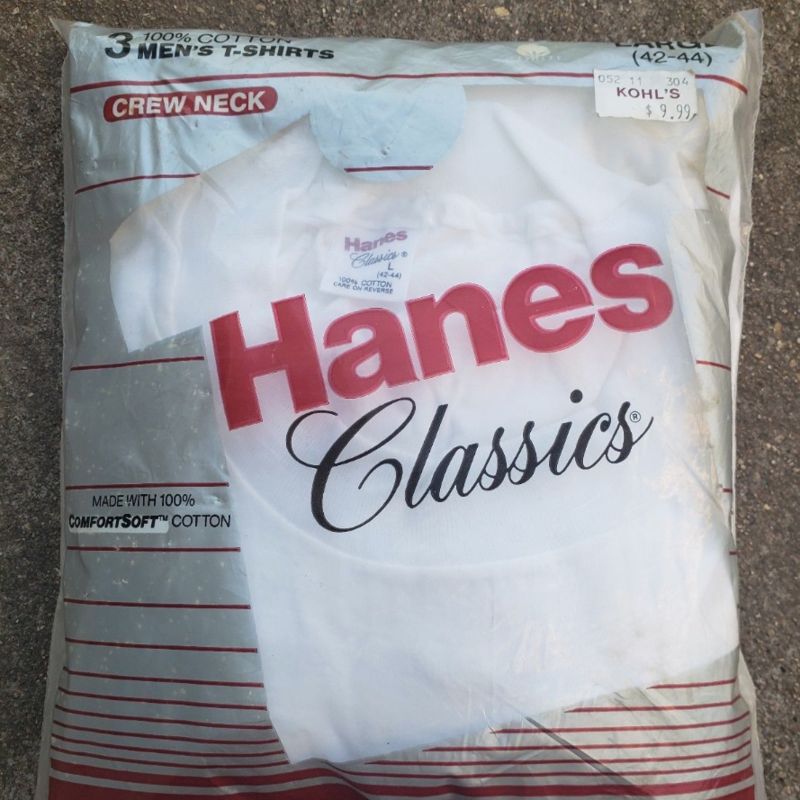 Deadstock or New Old Stock (NOS) describe vintage white t-shirts in new or unworn condition. It refers to shirts that were purchased by a distributor but never sold. 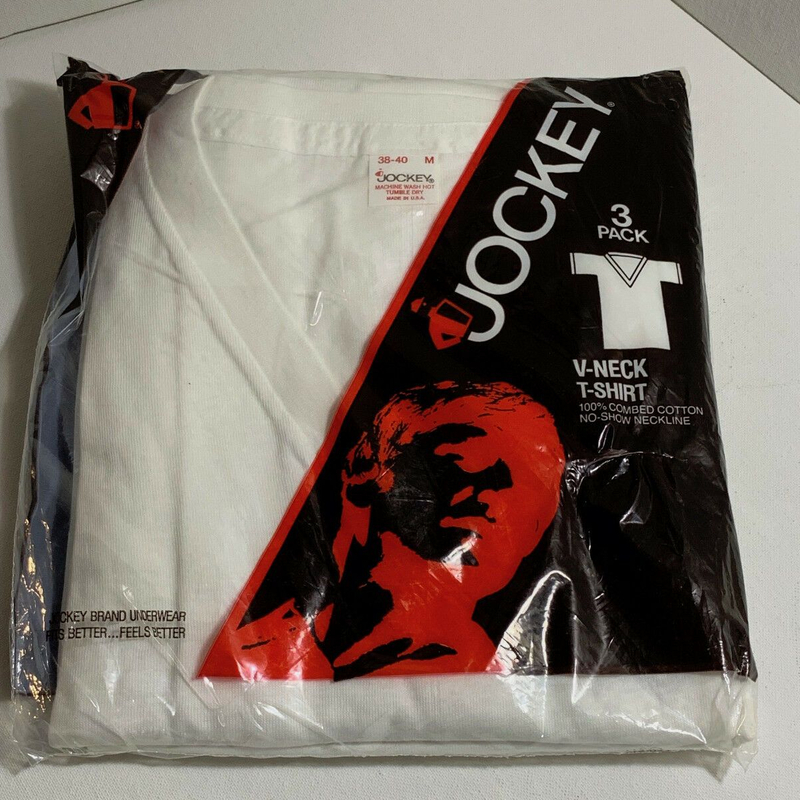 As they often come in 3-packs, many deadstock t-shirts have been preserved in plastic for decades. This ensures their newness, but it can also result in unusual stains along the folds and at points of exposure to light. Deadstock vintage white tees can be found on racks at thrift stores, too. The best evidence is the tag: The papery tag on many vintage t-shirts will degrade after a single wash. If it’s crisp, the shirt is likely unworn. Preowned White T-Shirts look pre-owned. If you buy a pre-owned vintage t-shirt on eBay, even if it looks clean in the photos, expect minor flaws. It’s a look for some people. Beat up white tees can cost more than new ones. We share this only because of experience: The length of these things varies widely. Remember: undershirts are designed to be tucked in. That image on the right is not distorted; we’ve handled tees that long. 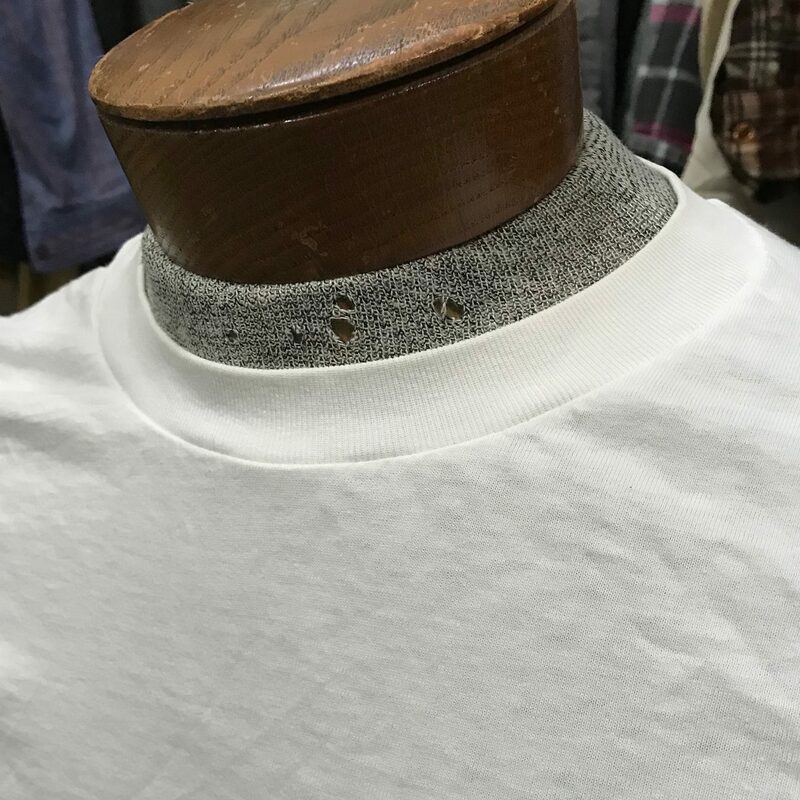 Finding a 100% vintage cotton t-shirt isn’t easy, but we prefer it when looking for undershirts. We find a cotton more breathable, especially when new. If you’re going for the true plain white tee look, we think it’s the way to go. 50-50 t-shirts tend need a little more breaking in to reach a pleasant softness. 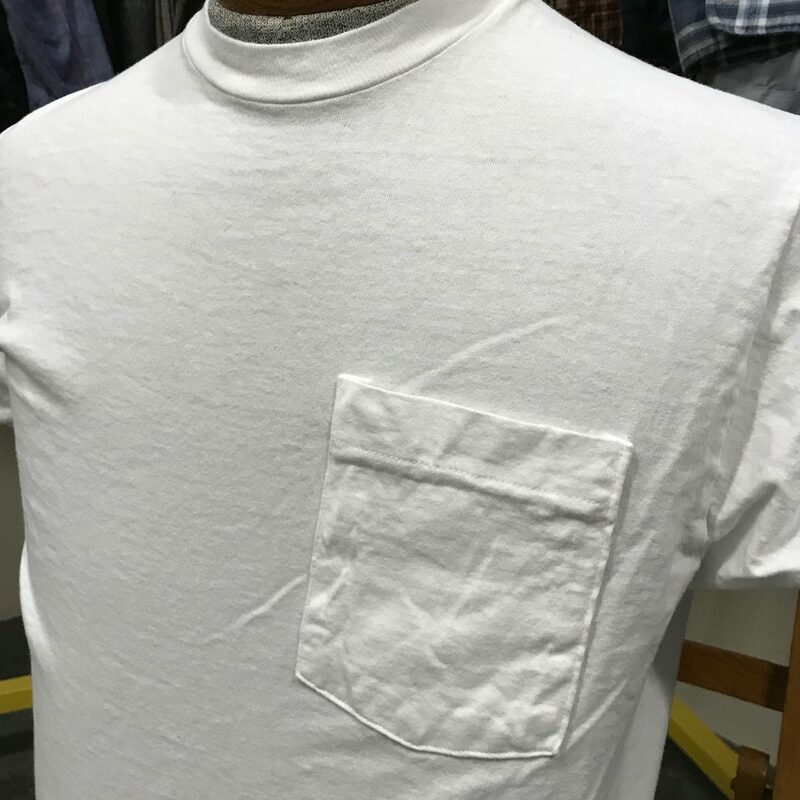 Pockets on a vintage plain white t-shirt are hard to come by, but they’re a nice little feature. As a result, pockets can jump the price of a t-shirt by $10-$15 dollars. 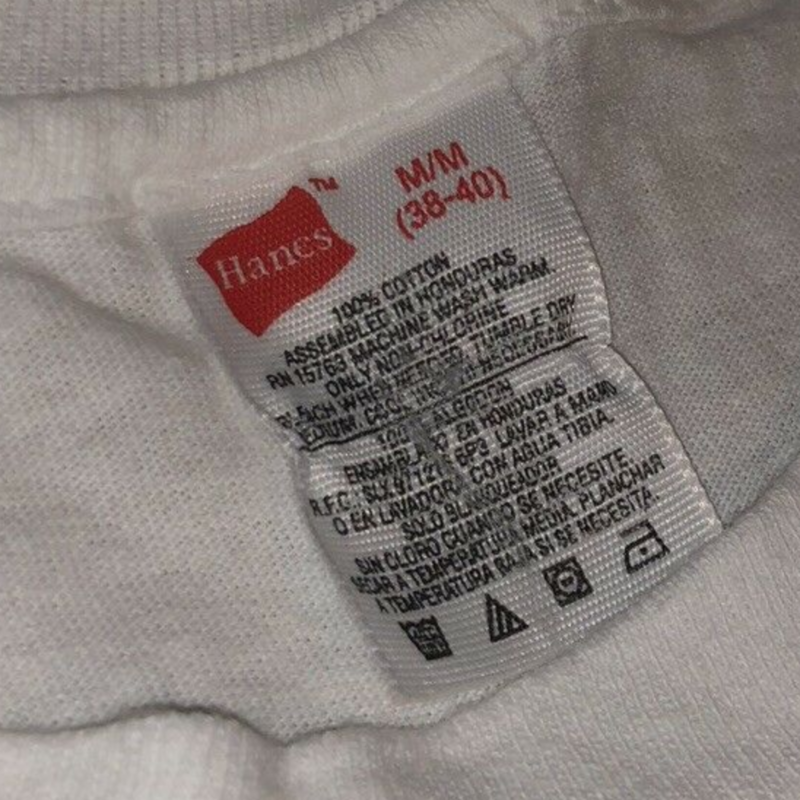 T-Shirts were mass-produced in America up through the 1990s. So, if you’re into the Made in America thing, you won’t have a hard time finding one. 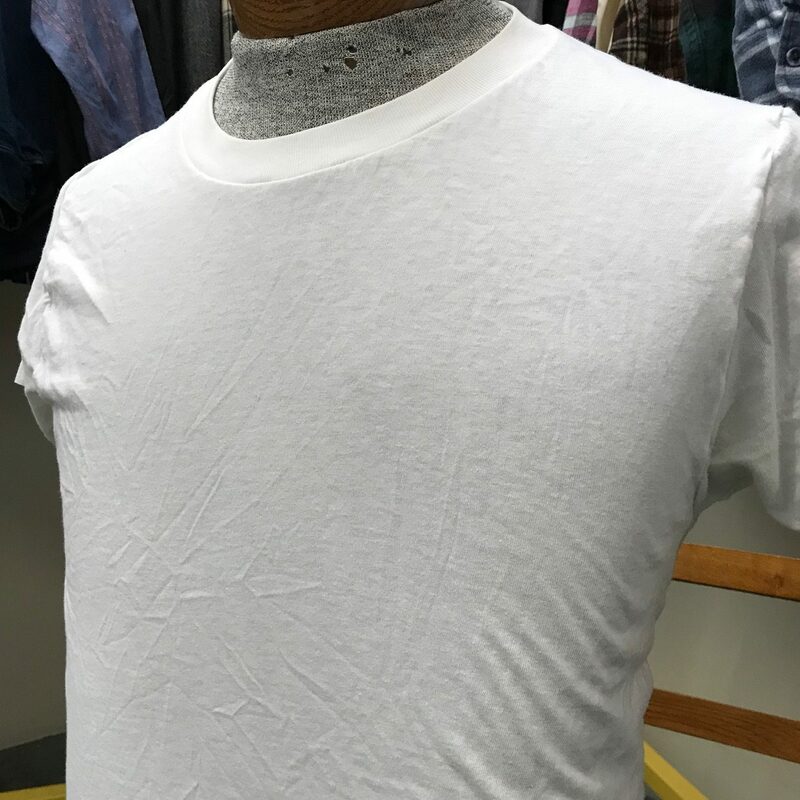 If quality is your only concern, though, you can find vintage deadstock t-shirts with all the preferred details–single stitch, 100% cotton, slim fit, and American fabric–but cut and sewn elsewhere, for quite bit less. BVD stands for Bradley, Vorhees, and Day, a relic of a way-back brand that’s been bought and sold several times. BVD t-shirts are generally 100% cotton, US-manufactured, and made from a heavier than average fabric. The ones that I have found fit true to size. 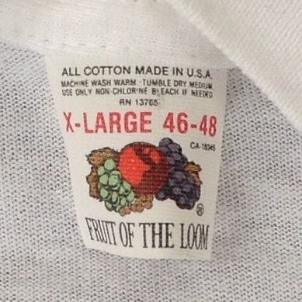 Fruit of the Loom is a reliable choice for white tees. They’re often 100% cotton, shrink a fair bit, and are sized small to begin with. Expect to size up. 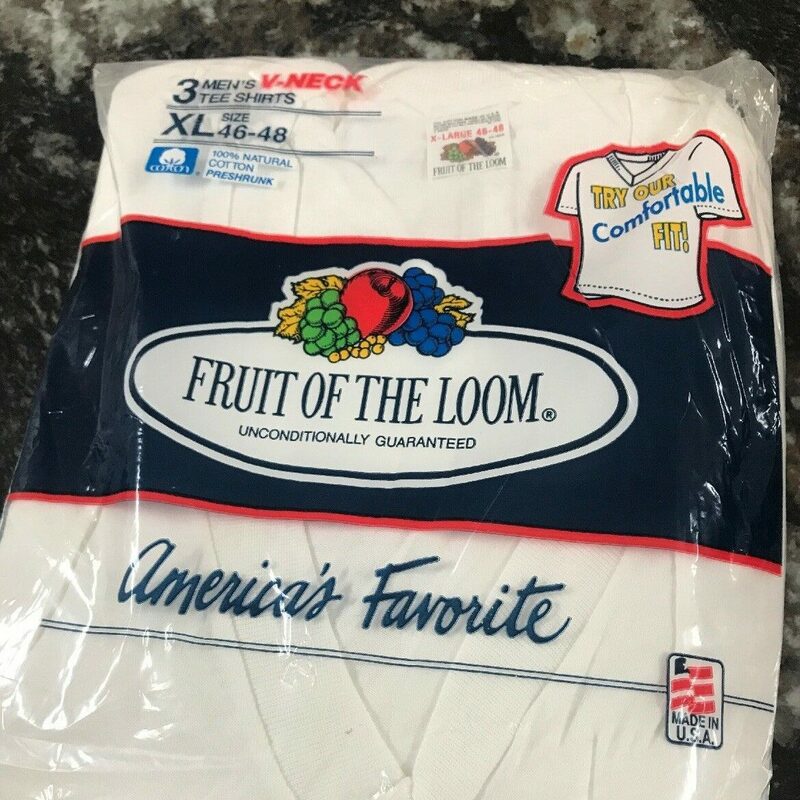 I have found Fruit of the Loom tees of surprising length. Be sure to check for measurements. 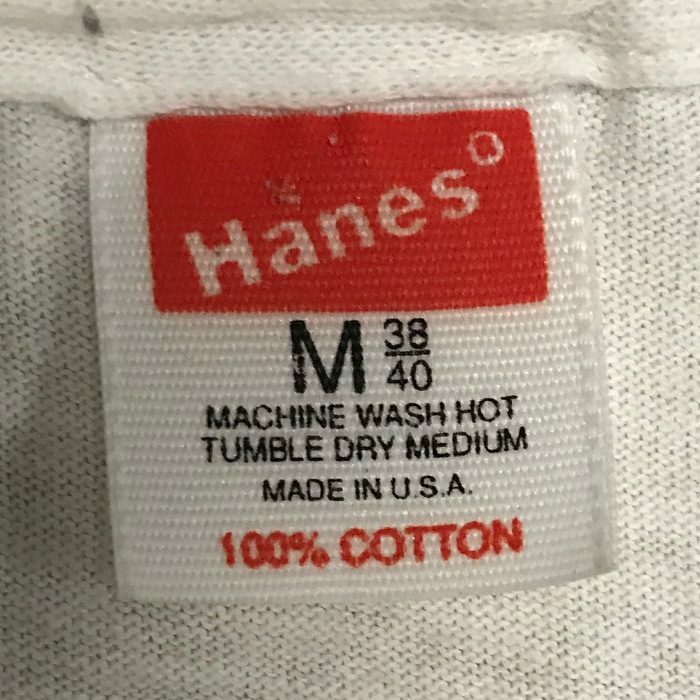 Hanes, too, is reliable. You can find 100% cotton white t-shirts, often with the red square logo. Older ones feature the red, blue, or gold banner tag. 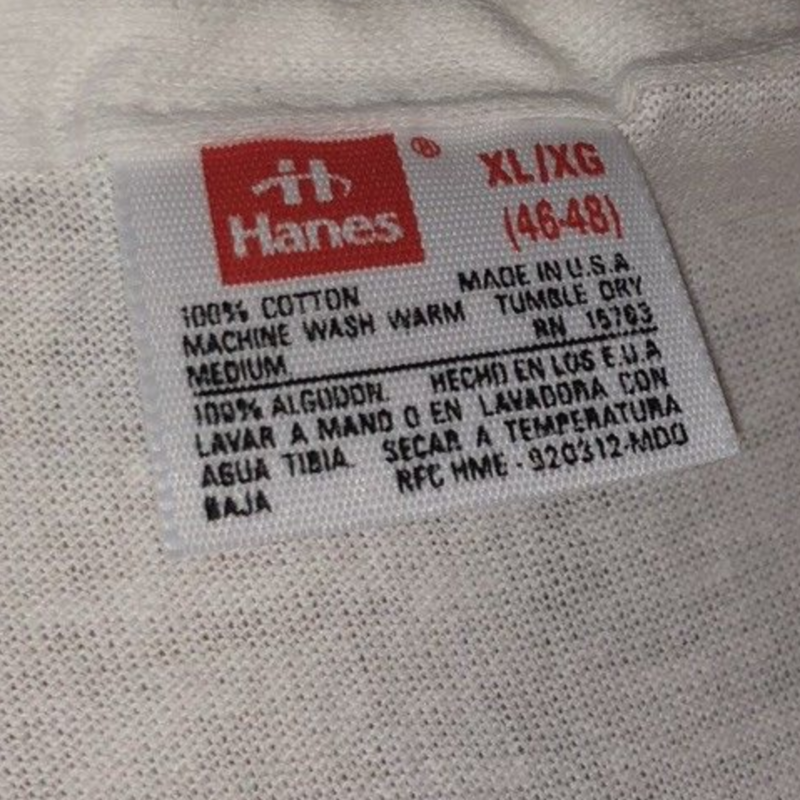 There are also quite a few Hanes 50-50 tees out there in the world. Expect to size up. 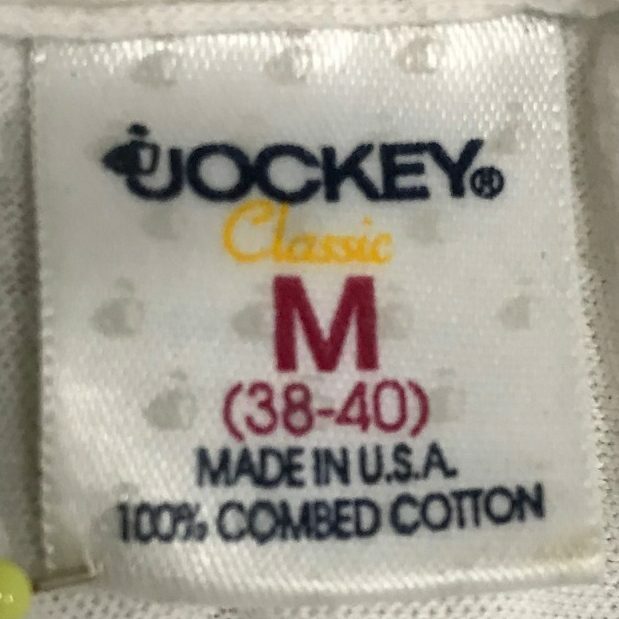 Jockey makes up the majority of my personal collection. I would size up one size. Generally, they’re 100% cotton. Munsingwear is the manufacturing company behind the “Original Penguin” brand. They made a lot of white t-shirts, including v-necks and pocket tees. 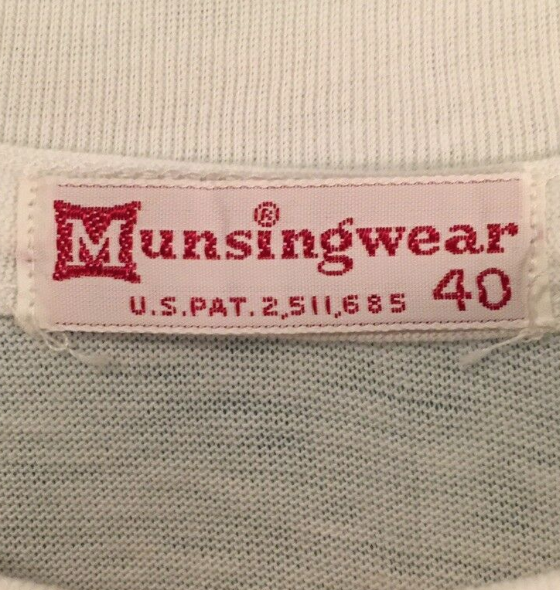 Most important, though, is that many Munsingwear t-shirts are 100% cotton. HEALTHKNIT: Healthknit tend to be a bit older and more rarely found than other brands, and so they carry a premium. But they are soft and a little heavier. I would size up one or perhaps two sizes. JC PENNEY: JC Penney is parent of several brands, but there are some pieces made under the eponymous label as well. 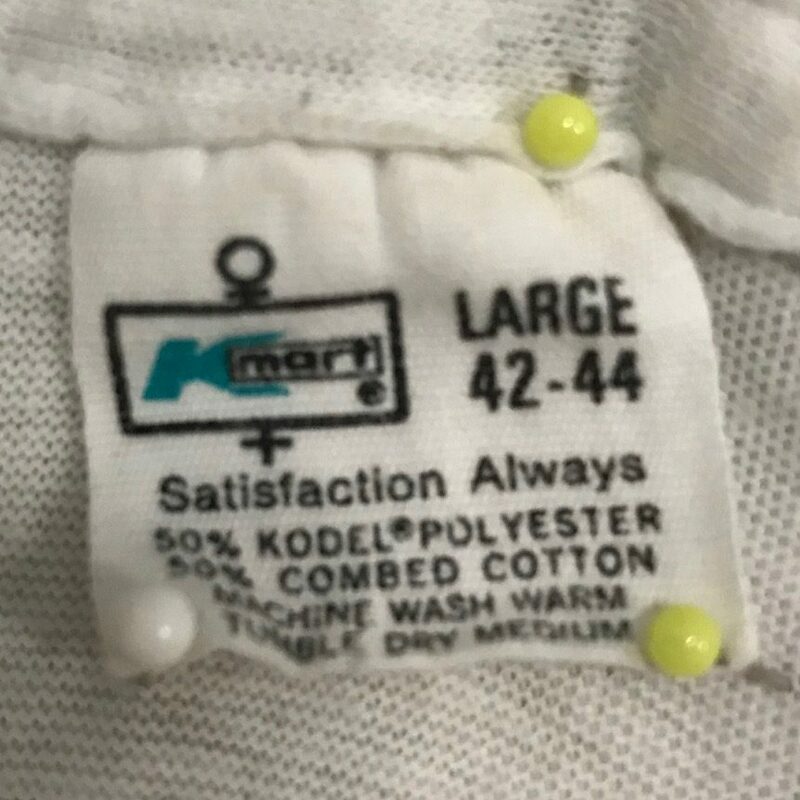 K-MART: Every K-Mart t-shirt I have found was made of a cotton-polyester blend. But there are quite a few of them out there in the world. I size up two sizes. SEARS: Sears, like JC Penney, sold tees under its own brand. They are comparable. TOWNCRAFT: Towncraft is private label from JC Penney. There’s quite a few out there, with a range of fabric compositions. Their perceived age occasionally increases their price. The cost of a plain white t-shirt varies widely, and to me seems influenced by the seller as much as the product. An experienced vintage seller will raise the price when appropriate; a generic picker might not. 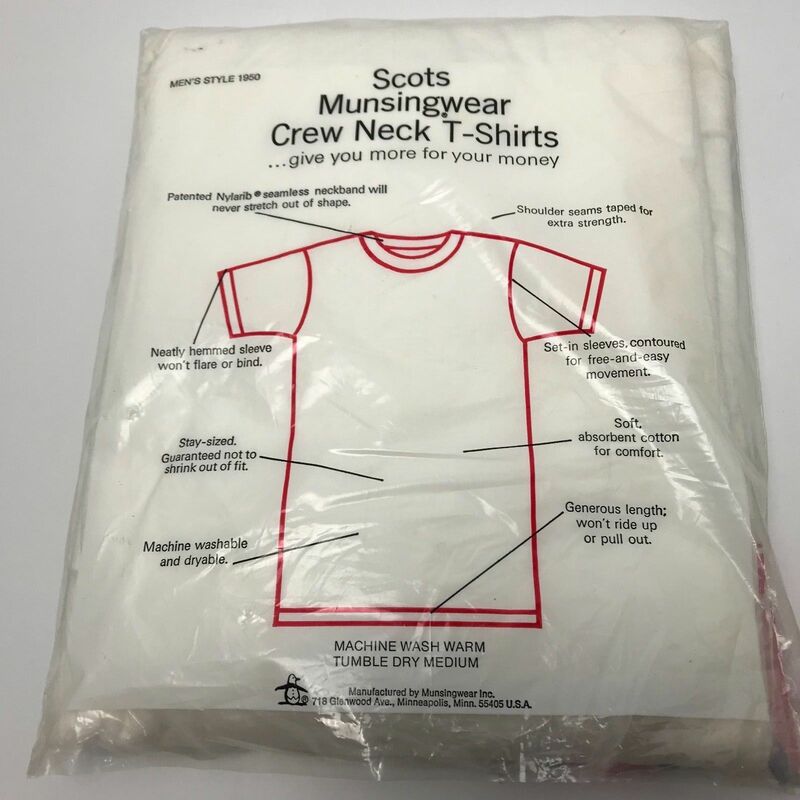 The highest prices are for 100% cotton white crewneck undershirts in popular sizes. 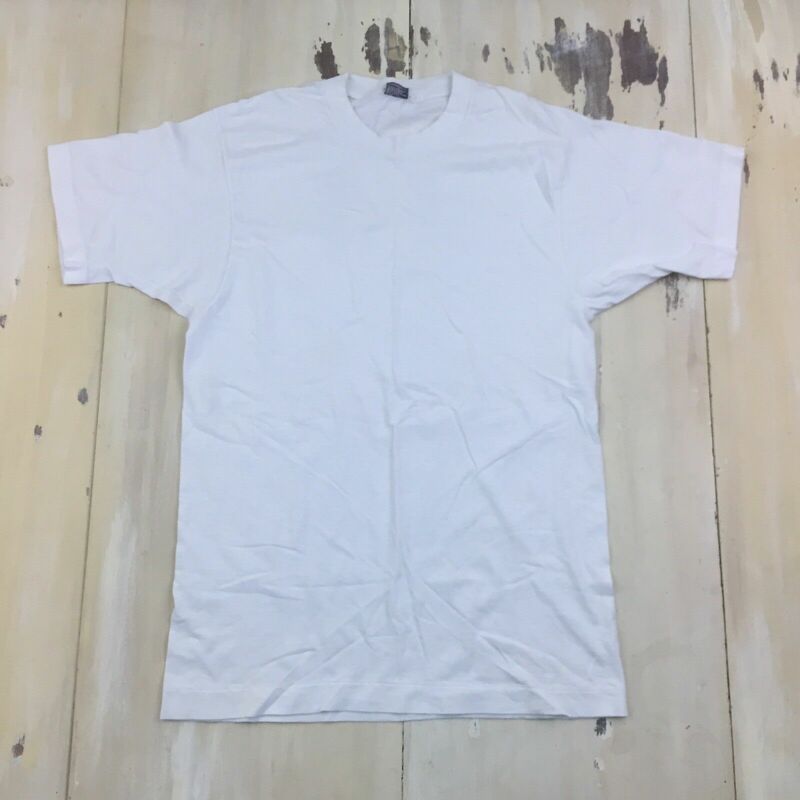 Vintage 100% cotton t-shirts will run you about $10-$30 a piece. Costs per shirt go down when you buy in bulk. A blank 50-50 cotton-poly crewneck t-shirt in a common color, like blue or red, can be had for $5-10$ a piece (Sometimes less). If you want a pocket in either case, the price might jump $10. If you want ringer sleeves and collar, the price might jump $5. Certain brands and tags carry a premium, but that’s more for collectors and preference than overall quality. Don’t be afraid to make an offer. A buyer sets a price that *someone* will pay, but it doesn’t have to be you. They’ll likely make a decent profit at half of what they’re asking; it never hurts to try. Sizing vintage white t-shirts can be challenging. Pay attention to measurements, especially length. Generally speaking, you will want to size up. Be particularly cognizant when buying deadstock, as these may shrink a great deal after purchase. Smalls are generally sized 34-36, and frankly fit smaller than that. I have found smalls that would reasonably be sized XXS in today’s market. 50-50 t-shirts need to be broken in. When you first put it on, the fabric may feel a bit stiff. After a few months, though, it will become quite soft while staying durable. The necks can feel a bit tight, and theres is not much that can be done. When you find a brand that works, stick with it. When looking for plain white t-shirts in thrift stores, consider the following. 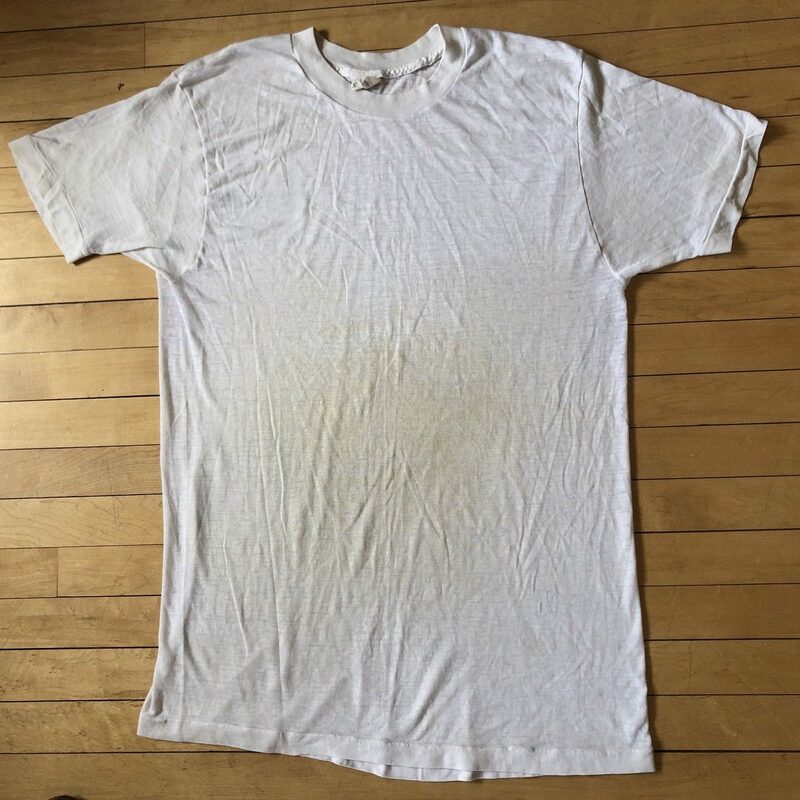 CONDITION: Plain white t-shirts are quick to show wear and stains. Stores like Savers and Goodwill tend to only put out clean pieces. If you are looking for a weatherbeaten look, you will not find it there. PAJAMAS: Blank white t-shirts are often hung up alongside pajamas and loungewear, not with the rest of the t-shirts. SIZING: The best fitting t-shirt might not be your marked size. Thrift stores generally sort by tagged size, so browse one size up. Below a few useful terms to have in your eBay search toolkit. [BRAND]: Including the brand in your search will help narrow things down. But leaving it out can be helpful, too. DEADSTOCK: Deadstock describes t-shirts that are vintage but that have not been washed or worn. The term is not as strictly used as with sneakers, but I find it used reliably. LOT: “Lot” describes a sale of multiple t-shirts. If you know what you want, buying a lot makes sense, as you save on shipping and likely per shirt. NEW OLD STOCK or NOS: NOS is used interchangeably with deadstock in most eBay listings. 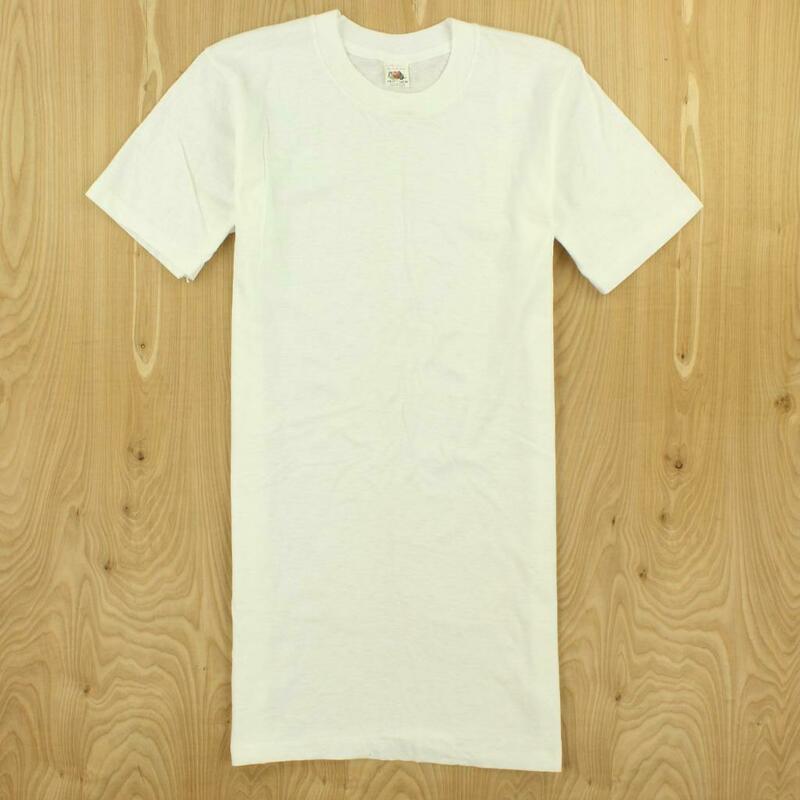 PLAIN WHITE: Using only “White” will result in a graphic t-shirts on a white fabric. The term plain white, though, only turns up blanks and undershirts. USA: While the quality between pieces might not change, being made in the USA generally only turns up vintage t-shirts. So, it is useful for that reason. At Comma Vintage, we ship out deadstock plain white t-shirts to our subscribers with some regularity. Join us by clicking the “subscribe” button below.